BURNS are commonly caused by thermal risks, such as fire, water, hot objects or liquids and steam, and are often caused by electrical, chemical or radiation exposures. Knowing what protection is suitable for a particular hazard is fundamental. Every year over 100,000 Australians sustain burns serious enough to require medical attention and over a third of these patients die as a result of the burns suffered. Occupational accidents account for the largest proportion of burns injuries to Australian adults (CSIRO; Health, Safety and Environment, http://www.minerals.csiro.au/safety/burns.htm, accessed on 07/12/05). According to the Australian Government Department of National Occupational Health and Safety Commission, the overwhelming majority (over 45%) of injuries caused by heat, radiation and electricity were to the upper limbs, well above the proportion of injuries that occur to any other bodily location (National Workers' Compensation statistics database www.nosi2.nohsc.gov.au, accessed on 07/12/05). 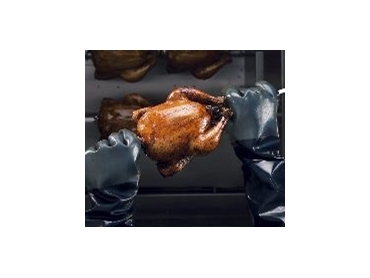 Appropriate hand and arm protection is therefore important in the safe handling of heat hazards. Ansell can help provide a solution to handling a wide range of occupational risks, with a selection of heat resistance barrier protection suitable for different heat extremes and elements. Ansell’s ThermaPrene combines the flexibility and chemical resistance of neoprene and the heat resistance of a soft thermal liner. ThermaPrene can protect against intermittent contact with hot surfaces up to 200°C and is virtually unaffected by detergents and common cleaning solutions. Handy design features such as a pull out liner and integrated hanging loop allow the heat resistant gloves to be stored and dried quickly - ready for use. ThermaPrene also features a roughened surface for improved grip, further decreasing the likelihood of mishandling and therefore the probability of accidents. Manufactured with FDA (US) compliant materials, ThermaPrene is also suitable for food contact. The tough nitrile impregnated fabric provides a hard wearing and cost-efficient glove, offering excellent resistance to cuts, snags and abrasion. Designed for intermittent handling of medium hot objects up to 180°C Crusader Flex features a sweat absorbent non-woven felt inner. Crusader Flex is an extremely hard wearing and long-lasting glove that can be laundered time and time again, thereby cutting costs. These top of the range heat resistant gloves provide heat resistance up to 350°C, ideal for many industrial applications. Made from a Kevlar outer, known for its strength and heat resistance, and a pure cotton inner, Mercury is a soft comfortable heat resistant glove that also offers excellent resistance against cuts. Mercury has no seams, making it safer for the wearer, plus metal splashes will not get lodged in the glove, there is less irritation and greater breathability. The high-tech materials ensure the gloves last a very long time and may be repeatedly laundered and re-used without significant loss of performance, proving to be excellent value for money. The real risk of burns in the workplace needs to be handled with care. When workers are protected, not only do injury costs reduce but productivity will increase. There is no 'one glove fits all' solution; even the best-made, most sophisticated glove may not be the right glove. Knowing which glove to use for each application is crucial, choosing the wrong protection and employees are at risk of costly and serious injury.